I’ve finally recreated one of my favorite pre-vegan meals. 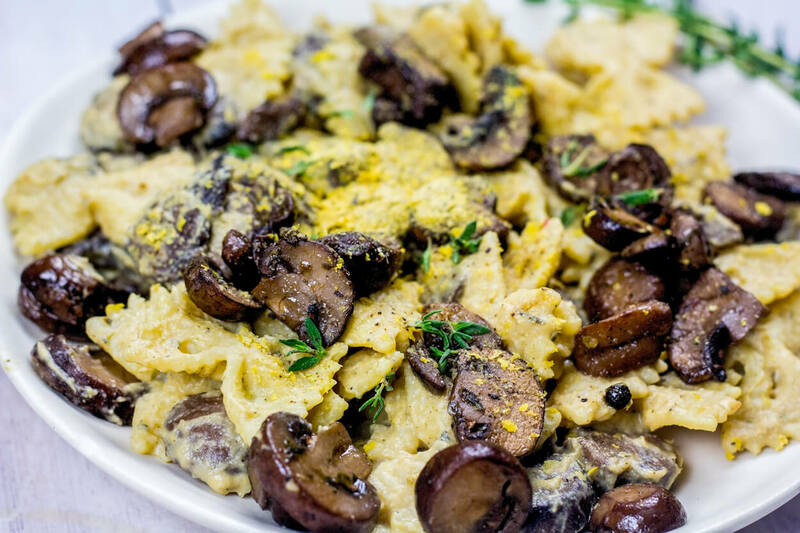 Luscious and rich Vegan Spaghetti Carbonara with the perfect creamy, eggy consistency. Garnish with (lots of!) homemade vegan parmesan and fresh parsley. Is there a dish you have been trying to “veganize” but it has taken forever to perfect? That’s this Vegan Spaghetti Carbonara for me. One of my fondest memories eating Spaghetti alla Carbonara was during the first trip I ever took with J – to the beautiful city of Rome. Our first night there we found the cutest little picturesque restaurant near our bed and breakfast. We ordered the loveliest, local red wine and I remember getting the Pasta Carbonara – J got the Carbonara Pizza (this was about a year before I became vegetarian). The homemade rigatoni pasta was coated in a creamy and rich pasta sauce with fresh parsley and salty pancetta. Although I would never go anywhere near traditional bacon and eggs Pasta Carbonara now (my five year veg-adversary is coming up! ), I have been trying to recreate this simple and unique pasta dish for years. I’m happy to say, this Vegan Spaghetti Carbonara reminds me of the Pasta Carbonara I ate in Rome. Dare I say it’s even better because it’s 100% cruelty-free and vegan?! If you make this Vegan Spaghetti Carbonara at home, snap a photo and tag me #CearasKitchen on Instagram or leave your feedback below! 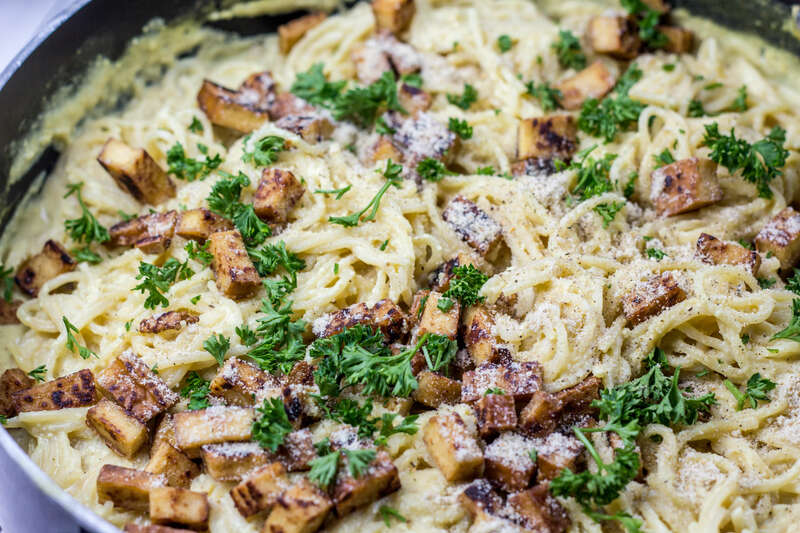 A few carefully selected plant-based ingredients make this Vegan Spaghetti Carbonara just right! Smoked Tofu: Adds the salty, smokey flavour to this dish. Fry until crispy and golden brown in a cast-iron pan. Try not to eat all the crispy smoked tofu while preparing the cashew cream sauce! I use this brand. If you do not have smoked tofu, make your own vegan bacon at home! 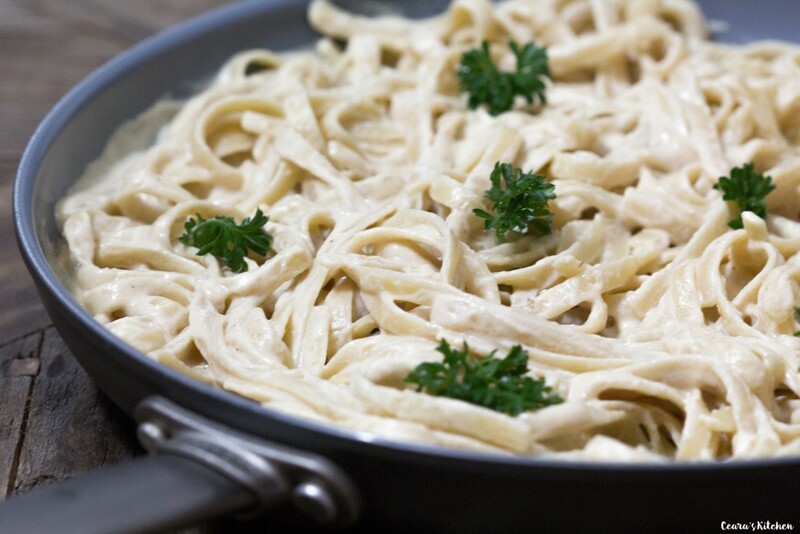 Cashew Cream Sauce: Cashew cream sauce made with sautéed onions and garlic, lemon juice and a pinch of mustard powder is what makes this Vegan Spaghetti Carbonara so incredibly rich, luscious, and CREAMY. 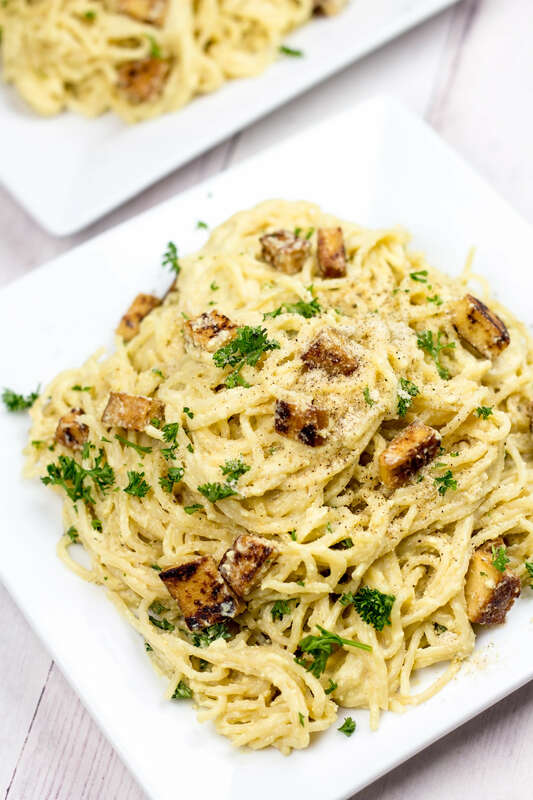 Extra-Firm Tofu: My trick to making this Vegan Spaghetti Carbonara super eggy is adding extra-firm tofu at the very end of blending the sauce (I pulse blend the tofu three times) so it is not completely combined. 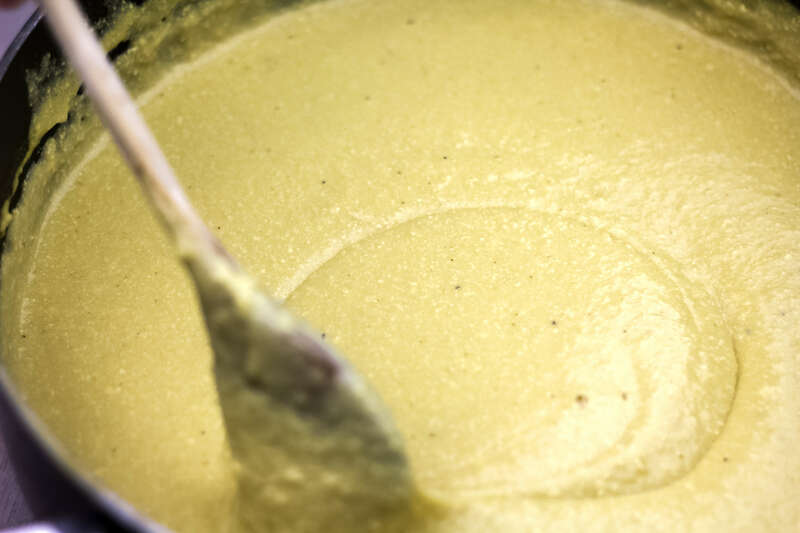 This creates the perfect eggy consistency in the creamy cashew sauce. 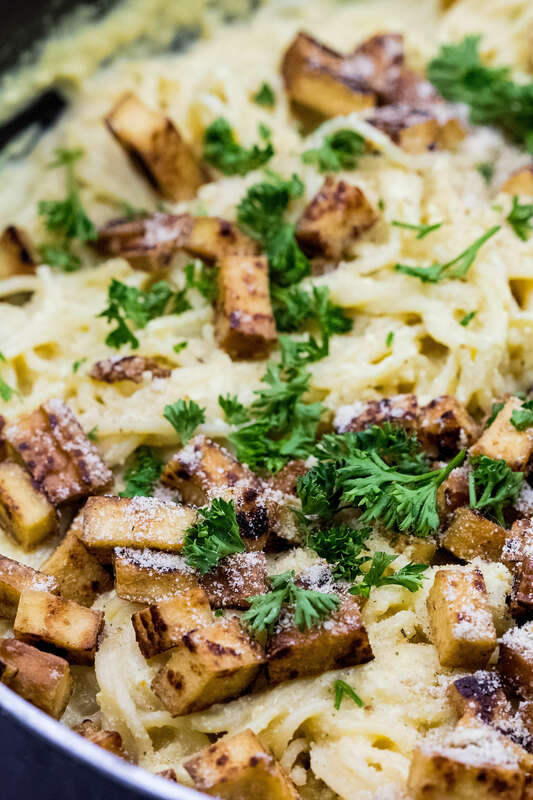 Get the recipe for my Vegan Spaghetti Carbonara below. Enjoy and don’t forget to top with lots of vegan parm. Soak cashews overnight or in hot water for 30 minutes. Cook 1 box of spaghetti in a large pot of boiling water until al dente while preparing the carbonara sauce. Vegan bacon: Cut smoked tofu into small bacon bits (see photo). Over high heat, sauté bacon until crispy and golden brown in a dollop of oil (about 5 minutes). Carbonara sauce: Over medium-high heat, sauté onions with a splash of water for 2 – 3 minutes until translucent. Add garlic cloves and sauté for 1 – 2 minutes until fragrant. Add sautéed onion and garlic to blender. Add cashews, lemon juice, vegetable bouillon, mustard powder, tumeric powder, tapioca starch and pasta water to the blender. Blend until creamy. Add tofu and nutritional yeast to the blend. Pulse three times until just combined but not fully creamy (see photo for reference). This gives the sauce the “eggy” consistency like in traditional carbonara recipes. Add the sauce to the pan where you sautéed the onion and garlic. Warm over medium heat, whisking constantly until the sauce thickens. Season with salt and pepper. 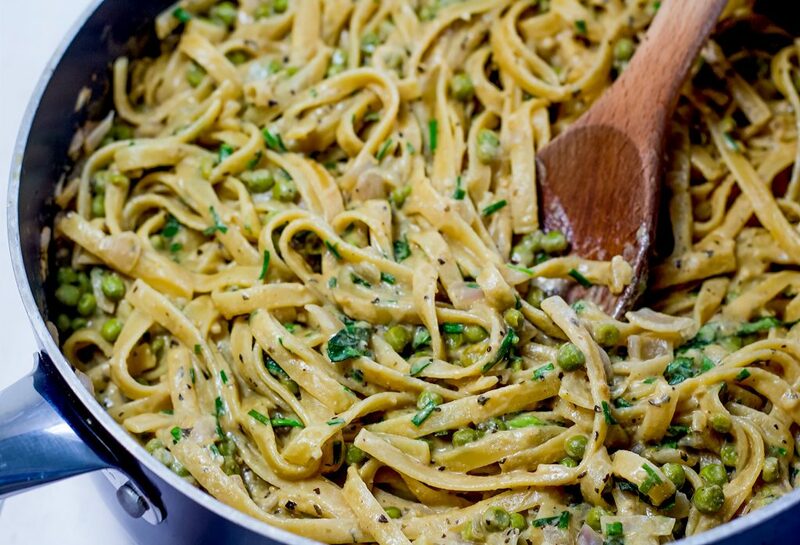 Make the carbonara: Stir the pasta into the carbonara sauce. Add the crispy tofu bacon and garnish with parsley, [url:4]vegan parmesan[/url], salt and pepper. Enjoy! Oil-free option: Bake tofu for 10 to 12 minutes until crispy and golden brown at 400F. 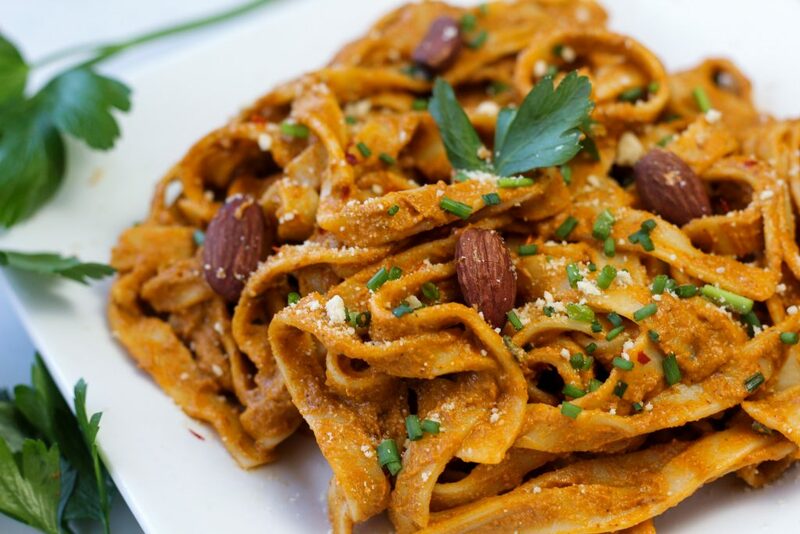 Gluten-free option: Use gluten-free spaghetti for this recipe to be gluten-free. Tried this out today and was pretty disappointed. The sauce wouldn’t thicken at all with the ingredients listed, so I ended up adding some arrowroot to get things going. The final amount was also about 50% more than I would ever feel comfortable putting on 16oz of pasta. Unless I was supposed to let this reduce all day, I’m not sure what I did wrong. This was AMAZING. 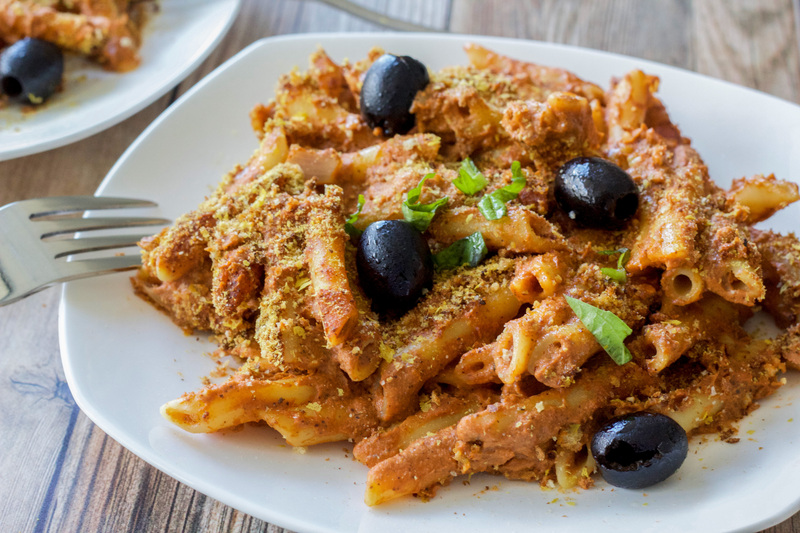 And you’re definitely right on in suggesting adding a healthy dose of vegan parm on top – I think it really puts this recipe over the top. I left out the tofu, so the texture was super creamy, and I doubt the flavor suffered. Most definitely making this again! Hi Ceara…. 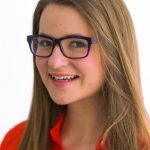 instead of tofu in the sauce what would you recommend as a substitute? Thank YOU!